I decided to head for Rivers Inlet today and pack it in for the year since the weather had been so bad. I had to be back at work in a week so I didn’t have a whole lot of time to spare. I was tired of being soaked and I was worried about my camera gear. A humpback zooming around the bay. They spend the winter in the clear tropical waters of Hawaii, having babies and not eating because there is little to eat in the tropics -- that's why you can see so far through the water. Then they migrate to our coastline for the summer and feed on all the productivity from the upwelling nutrient rich waters meeting summer sunshine. They have interesting feeding strategies including working cooperatively to make bubble curtains to corral herring schools and then chomping them down in one bug gulp. It was raining a bit in the morning as I packed up but as soon as I pushed off it ended. It was low tide so the low beach with eelgrass was nice and calm. Goodbye Brown Island! I'll be back someday! I made the kilometer long crossing to the mainland, a little wary of the humpback hanging around. A few seconds later. If I needed to come ashore I would be out of luck for the next 5 km or so, although there were a few sandy coves, albeit with fairly large waves. I have seen these barges a few times, loaded with colourful containers, heading north. It was a nice paddle along the open coast to the point where I would turn east into more sheltered water. There were lots of birds and some boats going by. This is a nice beach on an isthmus separating the peninsula from the rest of the mainland. This pigeon guillemot let me drift fairly close. This wasn't even taken with my bird lens. 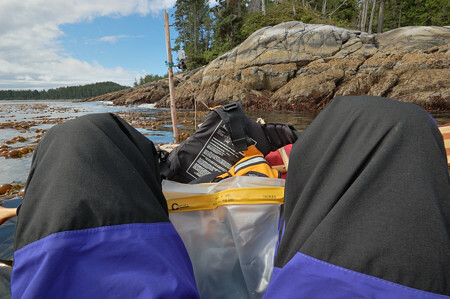 Taking a break after rounding the peninsula. Looking west. Here is the beach on the other side of that isthmus. It has a nice campsite. I wish I had stayed there an extra night. I crossed eastwards over the bay to the main part of the mainland, which I would continue along northwards. I was getting very warm in my drysuit in the sun. I had to pull the top part off. Wearing it would be out of the question; I would overheat in no time. I don’t know what you’d do if you were somewhere treacherous with cold rough water, where you had to wear it for safety reasons, but you were stuck out in the blasting sun. I paddled along under a big wide sky with the clouds parting around me. I looked west to the open ocean and to the productive seas all around me. In front of me was the rest of the world, an entire ocean of possibilities. I thought of all the marine life passing in and out of this place, some stopping to spend some time and others merely passing through on their journey to someplace else, maybe no place in particular. Others spend their whole lives here, gleaning their nutrition from sunshine and the sea water that swirls through, itself on its own never-ending journey around the world on the currents and through the clouds, all driven by that same sunshine. The fantastically intricate plankton glistening in the shafts of sunlight, going about their lives without knowing or caring about all the problems we create. 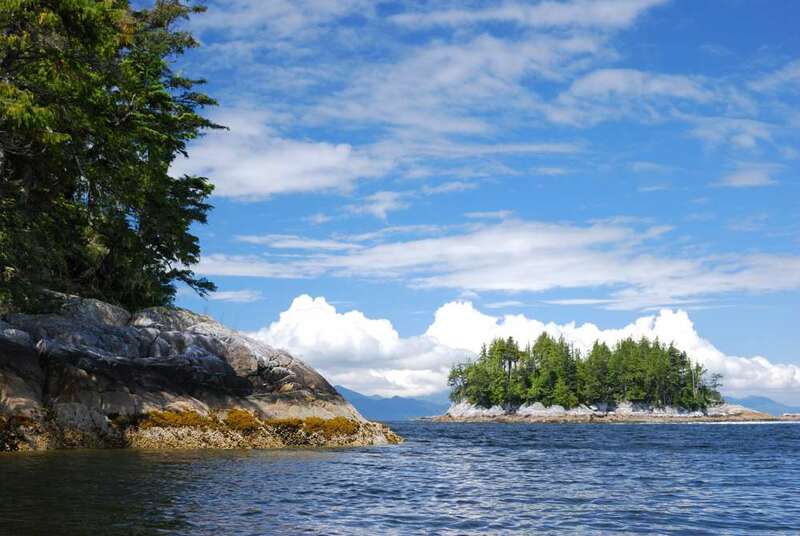 For a while I went back to my early years, wide eyed in amazement at the wonder of the ocean, back to those salmon fishing trips out to Barkley Sound on Vancouver Island when I was first immersed in our coast. The final leg of my trip this year was before me -- Duncanby Landing is at the base of that far mountain. But first I had some interesting little islands to make my way through. They reminded me of the Broughtons. I was in no rush. One of the fishing lodges I wasn't going to. After landing and taking my stuff out of my kayak I found this passenger that had been with me all day. This isopod was almost 2 inches long. There was actually two of them -- one underneath that was being mated with. First thing’s first was to have a big chicken taco salad in the dining room with Sirius Satellite Radio blasting classic rock from the 70’s. Sorry, chicken. I used the sat phone and arranged with Pacific Coastal for a pickup in a couple hours. I asked a young guy on the dock helping me with my stuff (what a nice guy) what their work schedule was like here — 3 months straight, 7 days a week. Wow, that’s impressive. At least there’s nothing to blow your money on out here. My first time in a Grummand Goose! Looking up Smith Inlet. I came out along the northern shore, from the back right heading towards the left. The southern part of Smith Inlet is a more convoluted maze of narrow channels between Greaves Island and the mainland. I wonder if anyone has ever been to those ponds on that mountain. That's Belize Inlet! Nakwakto Narrows is to the right just outside the frame. Belize Inlet on the left, leading through the narrows to Schooner Channel to the right, which you can't really see because it's mostly hidden behind Bramham Island. As we crossed the strait I looked across to Shelter Bay. No indication from here of the drama that went on there last year in the trees. That's "oil spill alley" from last year, where I had lunch before crossing the next big channel ahead of me. The pigeon guillemot nesting island is that little one on the left. That's what kelp beds look like from the air. We touched down and I was once again brought back to civilization. When I come out of the wilderness I notice that there seems something odd about how we act. After a few hours this sensation wears off, though never fully, I guess as I too re-integrate into the Borg collective. Funny, when I go into the wilderness I don’t feel anything odd about it… Must be the bond market. It influences us in ways more profound than we can imagine. I stayed at the backpackers hostel again and tonight there were fireworks on. The whole town was out, right in front of the hostel. The next day I caught the bus back to Courtenay. Fantastic trip and great photographs. I’m really enjoying the trips you’ve written up. Thanks for sharing it with us. Thanks Steve. This is my first attempt at a “novel”. I found your website from your posting at powell river persuader. Hi Jean, thanks. Hopefully more to come next year.